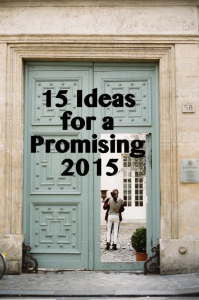 Look over the events of 2014 to determine how to move forward in 2015. Forget losing that last 10 pounds. Instead, go deeper and vow to improve your heart health, flexibility, stamina, and bone density. There’s always something more to learn. Not only does knowledge mean power but often the pursuit brings with it unexpected, memorable moments to savor. While we might have clear intentions of what we wish the New Year to be, resolving to let go and allow events and people unravel as they will can lead to amazing and magical moments. Improving your relationships will improve the overall quality of your life. Allow technology to be a tool rather than a crutch. Eliminating one bad habit can make a significant difference to the quality of your life. Do it. Why not choose to add a habit in the coming year that can actually help the planet? It’s easy, just remember to use reusable grocery bags or try to model behaviors that leave a smaller footprint on earth. Choose meditation or something else that will help you discover true tranquility, restore your mind and be your best self each moment of everyday. Being thoughtful is often something others don’t expect, but a simple act of kindness can immensely change their outlook (and yours too). The quality of sleep we receive each night has a tremendous effect on so many aspects of our lives. Make sure you get enough quality sleep each night. Make sure you get out of town at least once in 2015. Respect yourself just by choosing to allow the voice in your head to be a cheerleader instead of an incessant critic. Rid your home (and your life) of unnecessary things, including healthy relationships. Resolve to read new and interesting content. Not only will it be enjoyable, but you will foster new ideas, have intriguing conversation topics to dive into with anyone you meet and more importantly, you will no doubt learn something new.